It always amuses me to see the wingnuts redefine the meaning of the First Amendment. Palin told WMAL-AM that her criticism of Obama's associations, like those with 1960s radical Bill Ayers and the Rev. Jeremiah Wright, should not be considered negative attacks. Rather, for reporters or columnists to suggest that it is going negative may constitute an attack that threatens a candidate's free speech rights under the Constitution, Palin said. First of all, I don't think the voters need the media to convince them that Palin is running a negative campaign. I'm pretty sure they can figure that out by themselves. In the second place, the First Amendment means everybody gets to talk. Palin gets to spew her hateful rhetoric and the media gets to call it mean and spiteful. Additionally, as as Glenn points out, if you want to drag the Constitution into it: "The Constitution also guarantees freedom of association. Thus, by Palin's "reasoning," when newspapers -- or Palin herself -- criticize Obama for his associations, they're threatening his constitutional rights." Some days this campaign feels more like a really bad SNL skit than anything else. I mean, how bizarre is it that someone this uninformed about basic rights is running for VP? And a blessed Samhain to my pagan friends. Hope everyone gets lots of treats and no tricks. 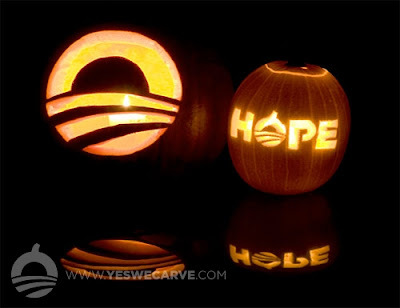 If you didn't get around to carving your own pumpkin, you might enjoy these, or these. A note to the young people. Also via Mike, early turnout figures. In Colorado, the state had already processed approximately 1.3 million ballots as of Thursday, around 60 percent of the total 2004 turnout. In Bernalillo County (Albuquerque), New Mexico (statewide figures are not available), 145,000 ballots had been cast as of Wednesday, equaling 55 percent of 2004's total. Just wow. No matter what else happens, the turnout looks certain to be historic. Update: Via Erin, "as of Thursday afternoon, 49 percent of Democrats had returned their ballots, compared to just 41 percent for Republicans, according to the state Elections Division. I spent the better part of the day at the unemployment office and left without resolving anything or filing an actual claim for a number of reasons. I hate when things get so complicated. Anyway, I have a bunch of links that I won't get around to blogging about but are certainly worth reading, so here's a little linkfest. Hart is looking for Michael Goldfarb and while on the search dissects the wingnut blogburst smear machine down to the molecular level. Fascinating reading but I guess he wasn't looking for Goldfarb in the right place, because here he is. He probably went into seclusion after that interview. Update: Hart found Goldfarb too. Dan also dissects the wingnut blogswarm but with an different angle and has lots more interesting bytes on the week in tyranny. Dan also wonders why do we need a president at all? Good question. What we need is a better Congress that will finally abolish personhood for corporations. Thom Hartmann explains why that would be a really good idea. In other news, all my favorite guys have apparently regrouped at the Swash Zone. Too much bloggy goodness over there so just start at the top of the link and keep scrolling. Pausing for a moment to focus on my state senate race, Liddy Dole, desperately flailing around for some muck that will slow down Kay Hagan's steamroll of her campaign, sank to a new low in smear politics accusing her of being an atheist. Hagan is Sunday School teacher and a committed Christian. Hagan strikes back with the perfect response. Speaking of local politics this is interesting from New Hampshire, "[T]he first time nationally that a delegate or alternate delegate to the 2008 Republican National Convention has publicly announced their decision to support Sen. Obama." Rats. Ship. Deserting. Meanwhile, I can't believe how emotional I've become over this election. 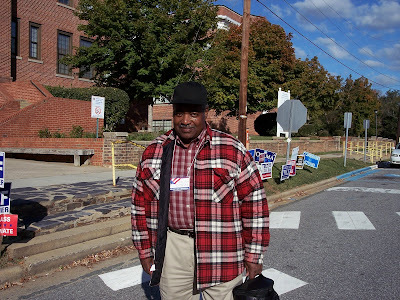 Stories like this one about the 109 year old black woman voting for Obama make me all teary-eyed. Via Watertiger who also has the ultimate picture of the day. If you need some cheering up, this human obama logo in Anchorage made me smile. Echidne's support thread for all those who suffer from election stress is so soothing, I just want to curl up inside that post and not come out until Wednesday morning. And finally, the baby turtle cheered me up immensely, so here's one more. Need something furry? How about a kitten? Heck, how about a lot of kittens and a couple of dogs? Oh, and some parrots for Fogg. Hope that helps. What happens when you choose a rabid cutthroat opportunist as your running mate? Wolf Blitzer: She was asked what happens in 2012 if you lose on Tuesday, would you simply go back to Alaska? Elizabeth Vargas of ABC News asked her and Palin said this, and I will read it to you verbatim according to an ABC News transcript: "Absolutely not," Sarah Palin says. "I think that, if I were to give up and wave a white flag of surrender against some of the political shots that we've taken, that ... that would ... bring this whole ... I'm not doin' this for naught," and that is a direct quote from Sarah Palin. Dana Bash: I just got off of the phone, Wolf, with a senior McCain adviser and I read this person the quote and I think it is fair to say that this person was speechless. There was a long pause and I just heard a "huh" on the other end of the phone. Longer quotes and video here. Our last real president appears with our next real leader in Kissimmee, FL, speaking to an estimated crowd of 35,000 at 11:00pm on a Wednesday night. Meanwhile, George Will takes another step further off the reservation. "Palin may be an inveterate simplifier; McCain has a history of reducing controversies to cartoons." That's the choice. A real president again or a caricature of Wile E. Coyote. I've made mine. The rest of you get out there and Barack the vote. If you want the smart analysis, go read Steve Benen who rounds up the best of it and adds his own cogent points. I'll just say that I didn't know what to expect and I was knocked out by it. It was really well produced, interesting and laid out his case well. I found myself wishing it was an hour long. In case you missed it, here's the video. All I'll add is I wouldn't want to be the janitor at McCain HQ today. Cleaning up the debris from all the exploded heads will be messy. Update: Yeah Obama-vision. The infomercial was viewed by 21.7 of all households, which apparently beats all the other programming in the time slot. Guess it was worth the money. I'm always amazed that people pitch me to link to their stuff on this little blog. It's not like The Impolitic is such a high profile site, but then again, I guess if you're trying to build steam for something, you're better off trying B-list bloggers since it's pretty much a given that the A-listers won't even read your mail since they get swamped with these things. In any event, Jason Argyropoulos, or someone claiming to be him, sent me this YouTube and I like it so I'll post it even though I think it's odd he wouldn't pitch his own company at the same time. By the way, I'm certain that John McCain did not approve this message. 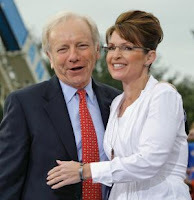 I've been facsinated by the infighting between the McCain and Palin camps. I read this yesterday and my first thought was, now they notice Palin is a cutthroat? I could have told them that three days after they picked her. But then again, I did a lot of vetting in those first few days. Too bad they didn't bother to do the same. They were having a 20% off sale that day but one wonders if the items were charged to Ms. Frugal's personal account or are still being charged off to the RNC credit card. Or maybe she will charge it off to her gubernatorial expense account. As I recall, she's been rather creative in foisting off family expenses on the taxpayers of Alaska. Witness McCain's pro-Americans. This is the fruit of the politics of hate. This is why we have to fight to the very last minute to turn out the vote and prevent this election from being stolen. In the half century I've been walking this earth I have never witnessed an election like this. Kennedy came close but this is deeper; it's bigger. Maybe it's because the world is so much more complicated now or it's the relief that our eight year national nightmare is about to end. Maybe it's the incredible prospect of breaking the race barrier for the office, but you don't have to be an American of color to be moved by the import this race. "Rosa sat so Martin could walk, Martin walked so Obama could run, Obama is running so our children can fly." Nate Silver reporting from Raleigh, North Carolina. Back at the rally, after the march had left MLK Gardens, I'd gone back for the car while Brett took photos, and I spotted a very old black man in a sharp Sunday suit walking slowly at the very back of the huge march. He hadn't yet arrived at the voting center, and I decided to find him when I got back. I wanted to go talk to him, to ask him what this moment meant to him. He was a guy who you take one glance at, and know, that guy's seen it all. I wanted a quote. I had my journalist hat on. I thought, this will be great. A young black boy, no more than eight years old, walked up to this man, who was at least eighty. The boy offered the man a sticker, probably an "I Voted" sticker, but I couldn't see. The man took the sticker and paused. Silently, he looked down at the boy, who was looking back up at the man. The man put his hand gently on the boy's head, and I saw his eyes glisten. I didn't ask the man for a quote. I didn't need to. I walked over by myself, behind the community center, and I sat down on a bench next to the track, and wept. Nate is not the only one. It's everywhere. I didn't get around to posting these earlier but they're still worth looking at for the contrast. This is why I believe the polls that show Obama with a big lead. He drew a crowd of 100,000 in Denver. Granted it was a beautiful day but look at how charged the crowd is to see him. It was a beautiful day in Albuquerque too but McCain wasn't looking that well. He only drew 1,000 people. 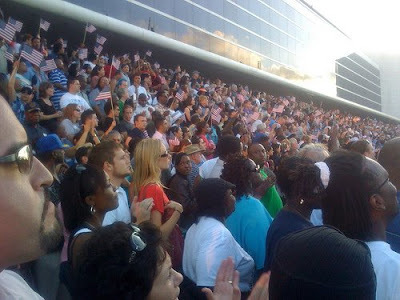 Just down the road, Obama had a crowd of 35,000 inside the arena, with another 10,000 or more outside. No pictures of that one. Palin, the great base energizer bunny, does better than McCain. But still, she only drew 5000 in Tampa. This may explain why Meghan McCain has been reduced to begging for votes. There's simply no way McCain can win this one without stealing it. I'm swinging between hope for a landslide and anxiety about a stolen election today but this definitely made me feel better. 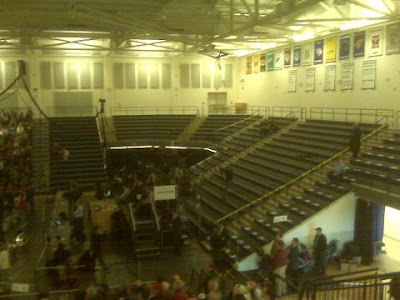 Palin cancelled her rally because of the weather. Guess she doesn't want take any chances on ruining her $150,000 wardrobe but Obama held his rally and 9,000 showed up in the cold rain. More photos here. Meanwhile, in Ohio at an indoor McCain rally. Whether people are stealing McCain signs out of people's yards or people are just removing them from their yards on their own, there are noticeably less McCain signs in Chester County, Pennsylvania than there were in September. Roughly 90% of the signs I'm seeing that are actually on someone's property (versus, on public land) are for Democratic candidates. And this is an historically Republican county. It's ridiculous, every one says something different and all the weighting and manipulation of the numbers reminds me of how the financial institutions rated all those "creative instruments" that created the housing bubble. Nonetheless, I'm fixated on them just like everyone else and there's something for everyone out there. Me, I like Pew's latest numbers as they seem to best reflect what I'm seeing in the state polling. 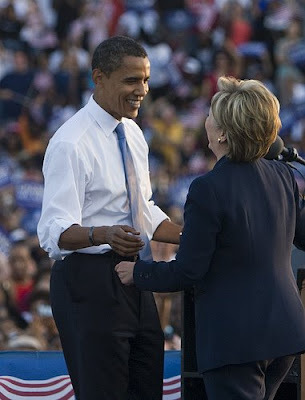 Barack Obama leads John McCain by a 52% to 36% margin in Pew’s latest nationwide survey of 1,325 registered voters. When the sample is narrowed to those most likely to vote, Obama leads by 53% to 38%. 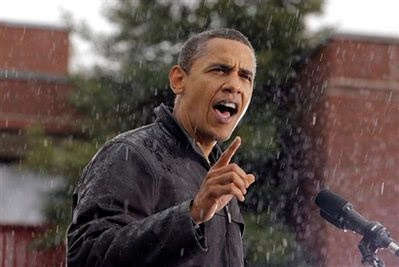 ...Obama holds a 53% to 34% lead among the sizable minority of voters (15%) who say they have already voted. Among those who plan to vote early but have not yet voted (16% of voters), 56% support Obama, while 37% support McCain. Makes you wonder how Gallup could be coming up with a 2-4 point margin. My new favorite is the 7/11 coffee cup poll showing Obama leading 60 to 40. On another note, Patrick did some research on the pendulum swings of party power and if you use that as guide, by all historical markers, the Democrats are due for their turn at the helm. Meanwhile, the defections continue. Republicans for Obama bought space in USA Today for this ad and Sully channels Letterman, coming up with the Top Ten Reasons Conservatives Should Vote for Obama. One week to go. I can't wait until it's over. Considering the growing reports of touchscreen machines flipping votes and the ongoing GOP campaign to eliminate legitimate Democratic voters from the rolls at the eleventh hour, and remembering the shock of waking up on the morning after in November of 04 to find against all indications that Bush had squeaked out a "victory" by a few thousand votes in Ohio, such a confident prediction makes me wonder what McCain knows that we don't. I'm sure I don't need to remind you that in the intervening years significant evidence has emerging that proves there was widespread vote tampering in the tallies and the same sort of voter challenges we're seeing now that forced many Democrats to cast provisional ballots that were never counted. Why the Democrats aren't addressing this now during early voting is beyond me. I've heard that the Obama campaign has an army of lawyers ready to protect the vote. So why aren't they already deployed where the problems are being reported? Updated: Damn. McCain is doing it again, predicting an upset that will "fool the pundits." I ask again, is he merely being presumptuous or does he know the fix is in? Watertiger finds a somewhat bizarre side effect of Palin's Wardrobegate. It appears her protestation that she usually shops at a consignment shop might cause some serious trouble for the small business owner. Addendum: On a personal note, what I find so amusing about this fracas is that (1) the clothes they chose for Palin are almost offensively generic (Cole Haan boots aside), and (2) she's even managed to screw the owners of "Out Of The Closet", her favorite shop up there in Anchorage. Seems that the name has already been trademarked by the AIDS Healthcare Foundation, which has been operating a chain of thrift stores in California since the early 1990's. The AHF was unaware of the shop before Palin's disingenous protestations, and is now contemplating filing a trademark infringement suit against the second-hand clothing store in Alaska. Schadenfreude aside, I really hope the AHF doesn't go through with legal action and instead is able to negotiate a name change for the unfortunate owner instead. I posted about the two young Neo-Nazi's who were arrested for planning to assassinate Obama at DetNews last night but more details are emerging. They expected to be killed by the Secret Service in the attempt and were really planned to go out in style, dressed in white tuxedos and white top hats. Never in a million years did I think I would be quoting Anne Applebaum but this is worth flagging. Here's what I do know: I would give anything to rewrite history and make McCain president in 2000. But in 2008, I don't think I can vote for him. Barack Obama is indeed the least experienced, least tested candidate in modern presidential history. But at least if he wins, I can be sure that the mobs who cry "terrorist" at the sound of Obama's name will be kept far, far away from the White House. It seems that Palin, in energizing the deranged fundie base and finally exposing their true nature, has done what years of appealing to logic and reason has been unable to do. Palin has succeeded in making it too embarrassing to be associated with the Republican party anymore. And I raise you two Obama effigies. Today's orchestrated mass outrage in Greater Right Blogstantinople is over this Halloween display that features Sarah Palin hanging in effigy. For the record, I think it's in bad taste and I don't condone such expressions of imagined violence no matter who the target may be. However, the apoplectic fits of the A-list wingers ring a bit hollow, and yes I'm talking about you Ms. Malkin. I don't seem to remember the coordinated blogburst of outrage when the man in Ohio got a early start on the Halloween season a couple of weeks ago and hung Obama in effigy, with a Star of David painted on his head. I didn't see any appalled posts on the hanging of Obama in effigy on the Oregon campus of a "Christian" college. I don't remember any condemnations of the numerous hateful portrayals of Obama that have risen repeatedly from McCain supporters and even directly from official GOP organizations. I do remember the many scoffing posts about why such incidents are not really racist. 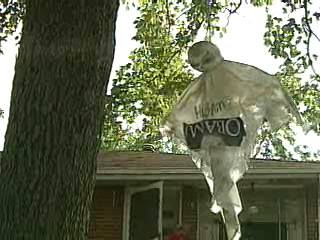 Hanging in effigy is a time honored tradition that dates back centuries. The NYT has an article archived from 1854 regarding the practice and wisely counseled even then that such symbolic violence is a waste of purposeful indignation. Further, given the long history of blacks being hanged by white men, I would suggest that the effigies of Obama are the more incendiary and dangerous as they roil old racial resentments. But either way, given the charged nature of this presidential race in particular, all instances of the practice should be discouraged equally, instead of being used as a partisan tool attempting to manufacture some sort of false moral equivalence. I expect no better from Malkin but I'm disappointed to see Ed Morrisey and Jazz Shaw stoop to her level. They used to be better than that. That's really what it comes down to in the end. The choice is between cautious and deliberate or reckless and impulsive. The latter describes the last eight years pretty well. The only question that really remains, given the stark differences, is how could anyone still be undecided? Where does Zogby get his numbers? I am so tired of daily tracking polls. There's too many people doing them and they're done too often to do anything except provide useless horserace talking points since they vary so widely. Still it's hard not to like the numbers if you're an Obama voter. WaPo is reporting Obama leading in Virginia. Virginia! Barack Obama has opened up an eight-point lead over Republican John McCain in Virginia, and the Democrat is entering the final week of the campaign with several core advantages when it comes to turning out his supporters, according to a new Washington Post poll. And of course Virginia is not the only traditionally "red state" that is going blue. Hard to see how anyone can spin the overall numbers as a "tight race." Not that it stops the pundits and McCain loyalists from trying. Meanwhile, McCain's answer to his flagging poll numbers? Bigger yard signs. Yeah, that will work. Song in my head. I've never heard of Alison Moyet before HoneyBear Kelly turned me on to this song last night. I like her. She reminds me of my friend Madeline Peyroux, only a little harder edged. And indeed, it won't be long now, although these last two weeks before election day seemed to be dragging along slower than the last day of elementary school before summer recess. Anyway, it's Sunday and we could all use some easy links to while away the time while we're waiting. This week's notable newspaper endorsement for Obama comes from Alaska's largest, the Anchorage Daily News. I hear the Detroit News endorsed McCain but I didn't bother to read it since one of my co-bloggers already complained about it and besides the Detroit Free Press endorsed Obama. I think in Detroit, newspaper endorsements don't mean much anyway and they cancel each other out. Speaking of being cancelled out, the silly case over Obama's birth certificate was dismissed for lack of standing. I expect that's why the wingers have moved on to horrified indigination over Obama's fundraising software. Meanwhile, Jerilyn has video and other coverage of Obama's rally in Denver today where tens of thousands showed up. 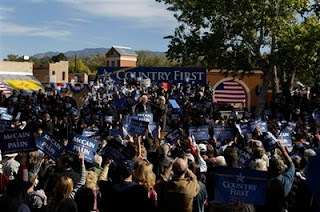 I hear in contrast, McCain managed to draw hundreds to a rally in New Mexico. Moving on to lighter fare, Colbert reacts to the McCain campaign's outreach to the middle class. Bob Geiger's Saturday funnies were especially good this week. Mikevotes has all the pictures of the day. McCain doing his best impression of The Penguin, Palin wearing a scarf that would seem better suited to a Democratic rally and I loved this one of Obama walking through his childhood neighborhood in Hawaii. It's not that the shot is so well composed, it's just the atmosphere of the hood. He's come a long way. I wonder what it must feel like to have come so far and be so close to making history. And for the eye candy. Marcellina is rooftop blogging in Austria. I love her blog. It's so beautiful there. It's worth scrolling through the archives to see all the gorgeous photos. On a different note, Phila's nudibranch blogging is in video form this week. Tell you the truth watching those critters move makes me a little squeamy but I couldn't stop watching. There's so many different varieties and they're all so beautiful. Finally, if you're looking for a job in DC, TPM is hiring two political reporters. I may apply for it myself even though I don't have near the creds to get it. You never know, they might give me a chance and I would love to work for Josh. Regular readers may have noticed I've installed google ads in a vain attempt to generate some income. So far I've made 55 cents. The thing about it is, I have no control over what ads appear and that McCain health ad has been there sitting there since I installed the widgets. I would note that any ad content that might appear here doesn't necessarily reflect my own views. I am not allowed to click on the ads myself to see what they say but anything that is paid for by the McCain campaign is likely to be a lie. Just so you know. 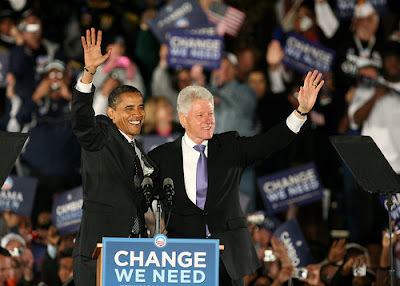 The A-list wingers at The Corner and their cohorts in Right Blogstantinople have been busy trying to gin up a fundraising controversy in their latest ploy to smear Obama, with an eye to cast doubt on an Obama victory. I see the WaPo finally picked up on the theme and is asking if campaigns funded by the people instead of big money interests isn't really a threat to democracy. Leaving aside that we're talking about 1% of Obama's fundraising here at best, hardly a massive problem, the WaPo is asking the wrong question. The Corner's minions have embarked on a huge effort to deliberately make fraudulent contributions to Obama's campaign in order to 'prove' the fraud exists. This is illegal. The perps are making public confessions, boasting of their criminality. So why aren't they being arrested? Update: Thanks to the commenter who complained in comments, Mark Kleiman confirms the fraudulent contributors are breaking two different laws. This is his latest two minute ad. I think it's great. 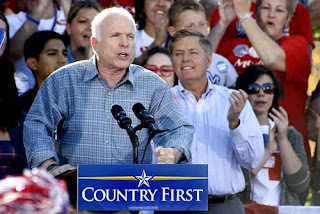 As Obama's poll numbers rise so does the tension inside the McCain campaign. It appears they're splitting into factions and Sarah is gathering together her loyalists with an eye on her own political future. I did a lot of research on Palin when McCain first yanked her out of the Yukon as his VP. I learned more about her than I really wanted to know and one thing is clear to me. The biggest mistake McCain made in his implusive pick was the failure to recognize her longstanding history of stabbing her allies in the back when they no longer further her own ambition. I think he'll live to regret it. By all indications, what we'll see in the next 11 days is the real Sarah Palin. She's increasingly willing to go off the reservation and is reportedly ignoring her handlers altogether at this point. Clearly her goal is to cement her creds with the base, the damage to the ticket be damned. What good that will do her in the long run is hard to predict. With the ugly, enraged underbelly of the base now exposed for the world to see, their support among moderates and independents diminishes daily. Palin may find herself the leader of tribe lost in the wilderness with little political clout left for the foreseeable future. But still, she's young and the pendulum will swing again someday. It always does. Update: Heh. They finally figured it out for themselves. While that may be his intent, Mr. Lieberman’s full-throated endorsement of Mr. McCain, his criticisms of the Democratic leadership on the war in Iraq and his extraordinary speech at the Republican National Convention have all but guaranteed that he may be frozen out of a walk-across-the-aisle kinda thing in the next session. Especially since the aisle seems to be tipped more favorably toward a heavier lineup of Democratic desks in the chamber. Joe also claims that Palin would eventually be ready to step in should something happen to McCain, saying she's smart and a quick study. That's true to some extent. Palin, although she's clearly inarticulate in her interviews, is not stupid. She is smart and learns quickly. The problem is, that she uses her intellect solely to further her ambitions rather than further her knowledge of the world. The only thing that bothers me about this circular firing squad is that these very serious Villagers have been wrong about just about everything in the last eight years. I hope and pray that this time they're finally right. I could write something about the meltdown going on in Greater Rightistanople but I could never describe it as well as the Bard of Blogtopia, so I'll just let Jon Swift tell you himself. For weeks Ace of Spades has been working on a super-secret story about Obama, which "called Obama a straight-up liar on his supposed 'flimsy' relationship with The Terrorist William Ayers" and finally connected all the dots, linking Obama and Bill Ayers, Acorn, Tony Reszko, Charles Manson, the Chicago mob, the Illuminati, Freemasons, the Trilateral Commission, Jewish bankers, Nazis living in South America, Fidel Castro, the KGB, the Four Horsemen of the Apocalypse, Bigfoot, Area 51, the Harlem Globetrotters, the Mormon Tabernacle Choir, the Bermuda Triangle, Mrs. Calabash and Mr. Gorsky. As the saying goes, read the whole thing for yourself. It's a trap. Just one more way to steal your vote. THE PROBLEM: "Straight party voting" on voting machines is revealing a bad pattern of miscounting and omitting your vote, especially if you are a Democrat. Most recently (Oct. 2008), a firm called Automated Election Services was found to have miscoded the system in heavily Democratic Santa Fe County, New Mexico such that straight party voters would not have their presidential votes counted. States with the straight ticket option are Alabama, Indiana, Iowa, Kentucky, Michigan, New Mexico, North Carolina, Oklahoma, Pennsylvania, Rhode Island, South Carolina, Texas, Utah, West Virginia, Wisconsin. Here in North Carolina, they designed the ballot with a straight ticket option and the trick is, if you use it, it covers all the partisan races except it doesn't include the vote for president. You still have to fill out that oval or it will be counted as non-vote in that category. The instructions for this on the ballot are written in tiny little type that I could barely read and the disclaimer is at the very bottom of the box. I doubt most people would read that far, even if they have better eyesight than me. To be fair, the poll workers at my voting place were explaining that to people, but I live in a small town and it wasn't busy. I doubt they always have time to do so, especially on election day itself. Who knows if they ever have time to instruct in the big cities. I hear the lines have been long already for early voting. As the saying goes, you can't make up this stuff. Adding to the irony of America's number Hockey Mom's transformation from down home pit bull to primped up power poodle, the most recent expense filings show the highest paid individual in the McCain campaign this month was Sarah Palin's traveling make-up artist. Amy Strozzi "was paid $22,800 for the first two weeks of October alone" under the cryptic heading, “PERSONNEL SVC/EQUIPMENT.” Talk about your rags to riches story. Eliza Doolittle never had it so good. Meanwhile, the one angle that the major media seems to be missing is McCain's cosmetic costs. The September filings indicate he spent $8,672.55 on make-up for himself in September. That's a lot of pancake, my friends. I've been wondering how many outfits $150,000 would buy. It seemed like a lot of money to me, even at the high-end stores. I've been waiting for some fashionista to price out the Palins' wardrobe. At that level of retail, designer suits generally only run a few thousand bucks apiece at most. It would take a lot of $800 Louis Vuitton bags to add up to that amount. That hasn't happened yet but the mystery about the purchases continues to unfold. It appears on investigation that the purchases don't add up or make sense. For instance, that $4,902.45 charge at Atelier New York doesn't show up in the store's receipts and the clothing line there is apparently quirky and not that suitable for campaign events. Additionally, of the two purchases made at the children’s boutique in Minneapolis, one is accounted for in the outfit the Palin baby wore at the convention, but the other $98 outfit, purchased days later, was for a 2 year old. The Republican spokespeople say they aren't concerned about fradulent charges to the Palin clothing account but it sounds to me like the Palin family's personal shoppers were doing a little personal shopping for themselves. Bob Schieffer's mom is right. I voted today and I do feel big and strong and it was really fun. Voting is a lot different here. Up north, it's a very somber and serious business. You're not allowed to talk to anyone and you must use the privacy booths. The ballots fold up so no one knows how you vote. Here in North Carolina it's more like a party. People mingle and everyone can see your ballot. I ended up sitting a table and was joined by these three charming women. I had them pegged as potential McCain voters and was braced to get the cold shoulder when they saw who I was voting for but it turns out they went straight Democratic, as of course I did. I shared my list of downticket candidates so we would be sure to vote for the right judges and we had a lovely chat outside afterwards. They don't allow you to take photos inside the polling place so I didn't get a shot of my vote number 4543 but I hung around for so long afterwards that I got a picture of the guy who tends the machine. I spent most of the time talking with these two Democratic party vounteers who were passing out sample ballots and answering questions. 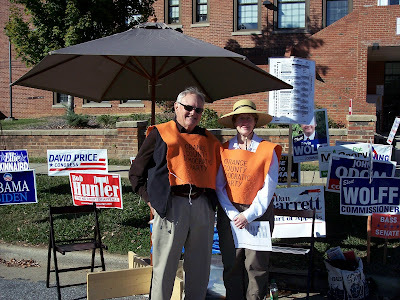 I pitched my blogs of course, and got the lowdown on the local election buzz. Word has it turnout has been about double across the state. My polling place in this very small town was not that busy. I didn't have to wait in line but they say it was steady all day and expect bigger crowds tomorrow through Saturday. I'm also told that the lines in Chapel Hill have been really long since early voting started. It was a pleasant hour and entirely the best voting experience I've ever had. It left me feeling energized and very positive about an Obama victory here. A feeling that was reinforced by driving through the neighborhoods on this gorgeous fall afternoon and noticing that the Obama signs outnumbered the McCain signs by about fifteen to one. Matt discovers that dating map that was making the rounds a while back has now been updated so you can adjust for narrower age ranges. In my age group the map is nearly obliterated by the big "100 extra women" circles. The only place in the entire country that has more men than women is Reno, Nevada. The map doesn't show much blue until you get to the 30 year old men range. Obviously, this suggests that older men are marrying younger women so the young guys and us old gals don't have a prayer to find a heterosexual life partner. By now you've heard that the RNC spent $150,000 outfitting Sarah Palin for the campaign trail. It's not so much the new clothes. It's the designer labels that are creating an image problem. And the stores where the clothes were purchased. As Robin Givhan puts it, "And in our culture Neiman Marcus stands for "elite," not for "Everyman." The same is true of Saks. Barneys? Make that soy chai latte-sipping, champagne-swigging elites." Exactly. That Louis Vuitton bag Piper is carrying for her mom costs about $800 and I suspect Saks or Barneys are not the usual shopping destinations for hockey moms. Quite a contrast to Michelle Obama's off the rack $148 Donna Ricco dress. Adding to the oddity, Palin didn't do the shopping herself. That appears to have been mostly done by Jeff Larson, "a prominent Republican consultant whose firm has been tied to the onslaught of negative robocalls from Senator John McCain’s campaign." Further, it wasn't just Palin who got new clothes, it was her entire family. Hard to see how they qualify as a campaign expense. In fact, it's hard to see why it's necessary to have the whole family appear at every single event. It's certainly not customary. Apparently, because the purchases were funneled through the RNC coffers, the expenditures don't break the law, but many Republicans are disgusted by this boneheaded ostentatious display. As well they should be. Even the wealthy are feeling the pinch and it's bad enough their donations are being spent on outfitting the entire Palin clan, including the poor baby that's dragged on stage as a photo prop at every opportunity, but it's just bad politics. I kind of moved on from MoveOn a couple of years ago. There's so many ways to get involved directly in online activism now that I rarely even open the emails, but when they told me I was in a video, well of course I had to check it out. I don't know they do it, but it's very clever and it made me laugh. Heretik has it. Here's mine. Click on over and leave your own. And speaking of hell, Watertiger has the picture of the day, of Cindy McCain. Ouch. Barack and Michelle both appeared at a big rally in Miami last night. The only crowd estimate I could find was for 30,000 people. Very little mainstream press coverage but Sinfonian liveblogged it in several posts and he thought it was probably closer to 50,000. He has more photos as well. Meanwhile, although AP came up with some bizarre poll this morning claiming the race was back to a virtual tie, most of the polling is showing a more significant spread. Fox News has it at 49-40 and MSNBC/WSJ have it at 52-42 for Obama. However, as we mentioned earlier, the touchscreen voting problems are popping up everywhere so every single vote is needed to offset the possible vote stealing. 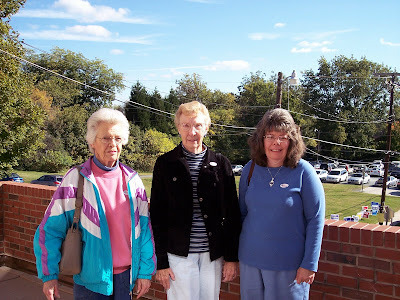 Vote early if you can, and bring some friends to the polls with you. SoBeale has the latest on the continuing problems with voting machines and other voter suppression. Of course, all the errors seem to inexplicably affect only Democratic votes and it's spreading from West Virgina to Tenneesee and beyond. It's making me nervous. I knew we should have pushed harder to go back to paper ballots for this election. Meanwhile on a brighter note, Rub Wrongways Records is encouraging voting with Pop the Vote. If you vote on November 4th you can get a free album download of your choice from the Rub Wrongways Records catalog. All you need to do is send us a picture of you at your voting place or wearing an I Voted sticker. The WSJ has a point. I don't recall anything like this ever happening, especially right before an election. Ben Bernanke effectively endorses the Democratic proposals for a stimulus package, that the White House is opposing. While the Fed chief said any stimulus should be "well targeted," even a general endorsement amounts to a political green light. Mr. Bernanke certainly knows that Mr. Obama and Democrats on Capitol Hill are talking about some $300 billion in new "stimulus" spending, while President Bush and Republicans are resisting. And by saying any help should "limit longer-term effects" on the federal deficit, he had to know he was reinforcing Democratic opposition to permanent tax cuts. I'm sure not this is helpful. It will piss off Republicans and can only contribute to the ugliness out there already. I'm telling you, the McCain supporters are already angry enough without adding fuel to their suspicions about the vast left wing conspiracy. I'll just let Rachel field this one. McCain cracking under the strain? I don't know quite what to think of this. It's not that he misspeaks, it's that it took so long for him to notice and he can't seem to find the right syntax to recover from the mistake. I sensed some vague confusion, as if he was struggling to remember the right words. I find it somewhat alarming. 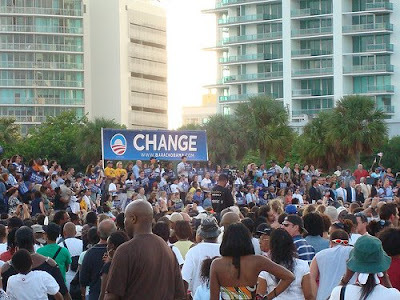 Obama is on a campaign swing through Florida this week. He held a rally that drew 50,000 in Orlando, appearing with Hillary Clinton. He's scheduled for a big event tonight with his wife in Miami that is likely to draw an even bigger crowd. Meanwhile, the latest PEW report shows Obama widening his lead in the polling. The top-line numbers: Obama leads McCain by 14 points, 53%-39%, among likely voters, compared to a 49%-42% result a week ago and a 46%-46% tie back in early September. On issues, Obama has vastly expanded his lead on the economy since the early September numbers. Back then Obama had an 11-point advantage, 47%-38%, but since then -- with the financial crisis and the presidential debates intervening -- Obama now leads by 21 points, 53%-32%, on the issue. McCain's all out negative campaign tactics seem to be working -- for Obama. The more McCain slimes, the higher the poll numbers climb. To tell you the truth I'm bored senseless with Palin. I really don't care what she has to say anymore, but this is just too delicious to pass up. The woman has been running for vice president for almost two months and she still doesn't know what a vice president does. Incredible. As a SNL skit, this would be hilarious. Since she's, beyond all reason, an actual serious candidate for the job, it's just terrifying. I have a ton of stuff to do this afternoon so here's some reading around the intertubz to amuse you for a while. SoBeale discovers trashed voter registrations in Las Vegas and ponders the end of libertarianism. Check out the comment section on that post. Hell hath no fury like a libertarian mocked. Our dear pal Capt. Fogg, rants in his inimitable fashion on privacy, public figures and the death of Fox News and don't miss his thoughts on spreading the wealth. And we haven't caught up to Kvatch in a while. He has a widget that shows the hotspots of potential touchscreen vote flipping. Somewhat encouraging news on the potential impact. Speaking of encouraging, Kathy at Stone Soup has been talking to Republicans who finally see the light on GOP hypocrisy. More and more, I think we're looking at sea change in the political landscape in 2 weeks. Mikevotes as so often happens, has the best picture of the day. And finally, here's the list of banned words for 2009. They'll be taking suggestions in the comment section for the next month or two. Leave your favorites there. Bonus link: This just in. Heretik brings back the six word novel. I never quite connected with this state and don't follow the local politics all that much but I am very interested in the Senate race where Liddy Dole faces a previously unexpected and serious challenge. The latest polling is encouraging. PPP officials said that Hagan is annihilating Dole among suburban voters, 54-36. I wonder how much of that is due to the extraordinarily negative campaign ads Dole is running virtually non-stop? Hate doesn't seem to be selling so well this year. 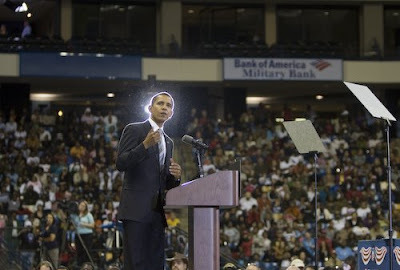 Obama paid a visit to my fair state on Sunday, holding a rally in Fayetteville. It was a mixed bag. 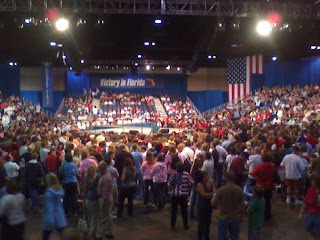 He was well received by his supporters, filling the center to well beyond capacity at 10,000 strong. Outside the rally, the picture wasn't so tranquil and the local bigotry manifested in 30 cars with slashed tires and one woman who rudely shouted "socialist get out" at some barbecue joint in town. You can get all the coverage, good and bad, from the sidebar at the link, including video of the speech and a photo gallery of the event. Meanwhile, early voting has started here and the town of Fayetteville opened up a couple of additional voting locations. A small group of McCain supporters found this offensive and heckled the voters -- for voting. One good ole boy claimed it was because they shouldn't open the polls on a Sunday and he was pissed off that they did it "just for Obama." He was proclaiming Sunday was for church going as he drank a can of soda he probably bought at a store where someone was working instead of going to church. He also apparently failed to notice that Sunday voting was going on all over the state. The protesters are mostly white. The voters are mostly black. Obama is poised to win this state. The latest local polling shows Obama leading by 51-44. More significantly, "McCain leads 55-39 among white voters, while Obama leads 92-6 among black voters." Watch the videos at the link and draw your own conclusions about the root motive behind the protest. I mean these fine Christians could be driving McCain voters to the polls. They are allowed to vote as well. Maybe they couldn't find any. Obama had an estimated 100,000 people come out to see him at the St. Louis Arch on Saturday. In suburban St. Louis today, McCain had a crowd of about 2,000. Now, it's a heck of a lot easier to draw a crowd on a weekend than a Monday morning. But stumping in the metro D.C. area on Saturday afternoon -- a much larger population center than St. Louis -- McCain had somewhere between 4,000-6,000 people. I'm detecting a lack of enthusiam here. Makes me wonder anew where McCain's poll numbers are coming from. Krugman nails it in a really good column today. I'm going to excerpt more than usual because it's so spot on. And bear in mind that all these data pertain to 2007 — which was as good as it got in recent years. Now that the “Bush boom,” such as it was, is over, we can see that it achieved a dismal distinction: for the first time on record, an economic expansion failed to raise most Americans’ incomes above their previous peak. Since then, of course, things have gone rapidly downhill, as millions of working Americans have lost their jobs and their homes. And all indicators suggest that things will get much worse in the months and years ahead. So what does all this say about the candidates? Who’s really standing up for Ohio’s plumbers? Mr. McCain claims that Mr. Obama’s policies would lead to economic disaster. But President Bush’s policies have already led to disaster — and whatever he may say, Mr. McCain proposes continuing Mr. Bush’s policies in all essential respects, and he shares Mr. Bush’s anti-government, anti-regulation philosophy. What about the claim, based on Joe the Plumber’s complaint, that ordinary working Americans would face higher taxes under Mr. Obama? Well, Mr. Obama proposes raising rates on only the top two income tax brackets — and the second-highest bracket for a head of household starts at an income, after deductions, of $182,400 a year. Maybe there are plumbers out there who earn that much, or who would end up suffering from Mr. Obama’s proposed modest increases in taxes on dividends and capital gains — America is a big country, and there’s probably a high-income plumber with a huge stock market portfolio out there somewhere. But the typical plumber would pay lower, not higher, taxes under an Obama administration, and would have a much better chance of getting health insurance. I don’t want to suggest that everyone would be better off under the Obama tax plan. Joe the plumber would almost certainly be better off, but Richie the hedge fund manager would take a serious hit. But that’s the point. Whatever today’s G.O.P. is, it isn’t the party of working Americans. It's like Krugman is living inside my head, it so perfectly describes the state of my life right now. And I'm really tired of arguing with people who would rather blame Bill Clinton for the meltdown than admit the GOP has taken them for fools. I don't see how any working person could possibly even consider voting Republican in this round.